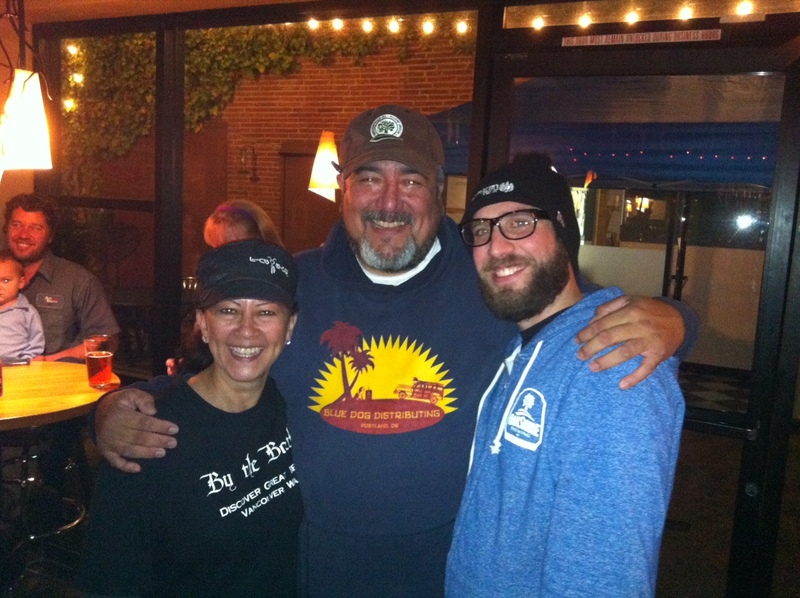 Arlene Nuñez, Dave Nuñez and Angelo De Ieso at Old Ivy Taproom. “I remember it like it was yesterday” says By The Bottle co-proprietor Arlene Nuñez. Along with her husband and business partner Dave, Nuñez recalls the very moment the original quaint craft beer boutique officially opened its doors to the public at 104 W. Evergreen Blvd. “It was on St. Patrick’s Day, March 17, 2006 at exactly 2:20 p.m.” Arlene says with a glow in her eyes and a sense of pride in her tenor. By The Bottle started off quite humbly and grew steadily adding more coolers along the way and even a pub area with some exclusive hard to find draught selections, many of which not available just across the Columbia River in Portland, Oregon. The Nuñez team along with some part time staff along the way paved the road for the early 2010s’ amped-up national craft brewing revolution in which several new breweries surfaced across the country; sales and demand for a higher quality product grew exponentially. Dave was the behind-the-scenes person making frequent trips up to Seattle to pick up those hard to find bottles while forging relations with distributors and breweries alike. Arlene since the start has been the face of the business, working long, sometimes seemingly endless hours doing what she calls her “most rewarding and enjoyable job of her life.” With a strong work ethic evident in an extensive career in advertising, sales, and customer service with companies like KINK FM-radio and Nordstrom, she knew that her work at BTB was her true calling. Her dedication and passion was evident to all who encountered her, many of whom quickly became regulars, learning about craft beer from their frequent visits to the shop. The Nuñez couple moved to the Pacific Northwest after spending most of their lives in Montebello, CA in Los Angeles County in 1998. “By The Bottle, in my mind, started over 15 years ago when I was traveling working for a Washington engineering firm. In my downtime out in the field I would seek-out breweries and different places to try craft beer.” Dave tells us. “My first experience with craft beer was in Juneau, Alaska when I went to do a project and had the pleasure of visiting Alaskan Brewing Company and trying Alaskan Amber for the first time. That was the beer that opened my eyes to craft beer.” he says with a glowing smile and his signature chuckle. From tart and sweet Belgian Flemish Red Ales to aggressively hopped India Pale Ales and everything in between, the many beers of BTB have served as a medium in which community and camaraderie have transcended the business of fermented grains with hops, water, and yeast. “We’ve met customers looking for recommendations on first dates who went on to get married and have kids” Dave tells us, explaining how much more the shop has been beyond a simple mom and pop business. Taps were installed in the rear of the original BTB location in 2010, offering customers an opportunity to spend more time in the beer digs they grew to love with an unmistakable vibe generated from the community of craft beer built by the Nuñez team. 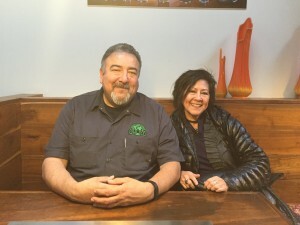 In 2012, the lease for the space where BTB began expired just as an opportunity arose when friends and business neighbors Larry and Anna Pratt decided to call it quits at their next door Salmon Creek Brewpub at 108 W. Evergreen Blvd. The transition made perfect sense for Dave and Arlene. This is when Old Ivy Brewery and Taproom came to life after a much involved remodel that year. By The Bottle moved in to the special event venue space across the patio and breezeway making it convenient for customers to pick-up some to-go bottles after the sit-down offerings from house brewed beers as well as guest taps at Old Ivy. It wasn’t long until more of downtown Vancouver, WA really starting catching on to the craft beer revolution and with the de-regulation of alcohol in the state of Washington, many gas stations and corporate markets were offering a selection that made BTB’s viability tougher to compete in the marketplace. This wasn’t the ultimate factor in Arlene deciding to soon close BTB as a regularly functioning retail outpost, but it didn’t help small businesses like hers. March 17, 2016 marks a decade of craft beer servitude and love for the community at By The Bottle and the ending and beginning of a new era for the Nuñezes. What is to come specifically at the location is still in the workings but one thing about the experiences of this wonderful little shop on W. Evergreen Blvd. remains true. “It was always about the people and their stories and their funny antics that made us love what we did so much!” says Arlene with tears of passion in her glowing brown eyes. “I am always looking forward to the future, in trying new things and building upon the great community of people I have been involved with” she says. By The Bottle’s 10th Anniversary open house happens on Saturday March 19, 2016 from noon until 9 p.m. Special 50% off savings on beer memorabilia and other “deep discounts” on tagged beers taking place all day long. There will be some not-to-miss special bottle releases and snacks as well. An Official toast to take place at 7 p.m.
For more information visit http://bottledbrews.com/ or call (360) 696-0012. By The Bottle is located at 108 W. Evergreen Blvd. Suite B and is next door to Old Ivy Taproom and Brewery. Also, look for a special Portland Timbers event with Widmer Brothers Brewing on Saturday March 25, 2016.